I heard about the LG Tone+ through a friend at work who said it was the best pair of headphones they’d ever owned. Now, I’ve tried out more than my fair share of headphones, and while most have worked out, none of them had a wow factor. I had a hard time believing that these would be the headphones to change that, so when LG sent them to me, I had to put them through the paces and then some. My first task was to charge them up, which took about an hour and a half. Not bad considering some of the ones I’ve had in the past took around two hours or more. The next thing I did was pair it with my iPhone 5 (which was as easy as 1…2…3) and then take them for a test drive. I’m not allowed to wear headphones in my ears at work, so instead I let them sit around my neck with my music on high and when I received a phone call, I put one of the ear pieces in. The magnets that keep the ear pieces in place are just the right strength to keep them in place and easy to pull when you want to wear the ear piece. I did this for about three days for 8 hours a day (not including stand by time) before the low battery alert started to kick in. The low battery alert plays once every two minutes until you either turn them off or put them on the charger. My iPhone also showed the battery level of the headset next to the battery indicator for my phone, which was a major plus. I personally never had to check the battery status, but it’s easily done by pressing the volume down button for one second and listening to the audible battery indictor. Something I really like about this headset is its simplicity. Instead of hearing a series of beeps that you have to memorize and decode, the headset speaks to you instead. If your battery is low, there’s no fast beep or slow beep to listen for. It simply tells you “battery low”. The buttons are also separated on the head set so you don’t have to remember if the top button is for calls or the bottom button is for playback. Playback buttons are on the right and phone call buttons are on the left. The call button also has an LED indicator light that blinks blue when in use and red when you have a call, the battery is low, or the headset is charging. Unlike my other Bluetooth devices, such as the one in my car, I never once got a complaint from the person on the other end of the call. Most people that I talked to said they didn’t realize I was talking on a Bluetooth headset. I only had one serious problem with this headset, and that was when I would work out and dance to my music. The headphones didn’t like staying put with all the motion, and more than once bounced off my neck. I found a way around this by wrapping my tank top around them or placing them under my sports bra strap. Overall, I’m very satisfied with the LG Tone+ and so far there hasn’t been a day since I received them that I haven’t used them. A major plus was if I only used them while at work, they easily lasted for more than three days. 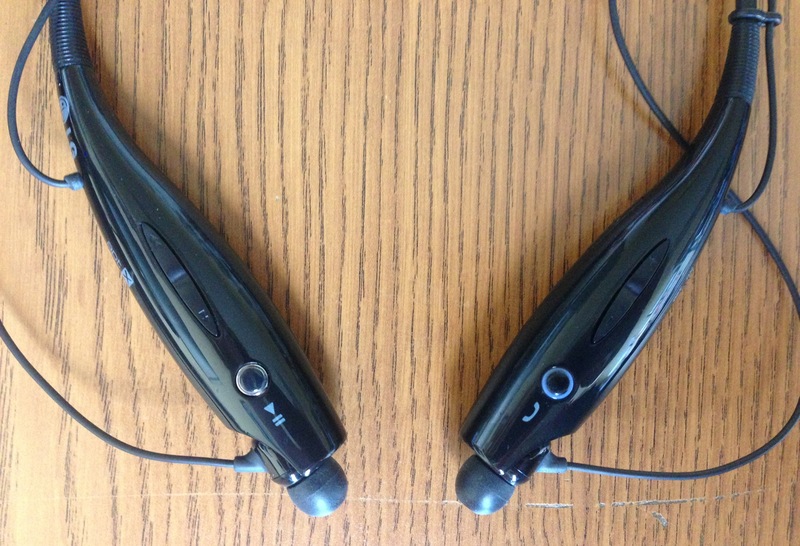 So, if you’re looking for a reliable Bluetooth headset for music or hands free calling, I highly recommend you give these a shot. Retailed at $79.99 (available for $52 right now on Amazon) you can’t beat them. ← The Sky is Falling! Asteroids and Meteors on the Same Day!